Even after multiple crashes, investors still tend to pile into overheated sectors. Where are the biggest risks today? Investors have lived through the calamitous crashes of real estate and tech stocks in a single decade. You'd think we would have learned to avoid the sort of frenzied enthusiasm that causes an investing category to see its value inflated beyond all reason. Alas, that is almost certainly not the case. Didier Sornette, who studies bubbles and is a professor at the Swiss Federal Institute of Technology, says low-interest-rate, low-return environments, where everyone is looking for safe havens (sound familiar? ), are perfect for new investment manias. "This is a fantastic time for bubbles," says Sornette. 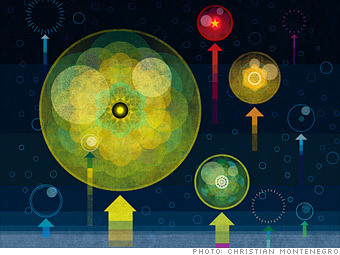 "Right now there is not one bubble, but many, in our analysis." With a surprising quantity of investing categories looking excessively frothy, Fortune decided to examine some of the leading suspects -- and a few unexpected ones.